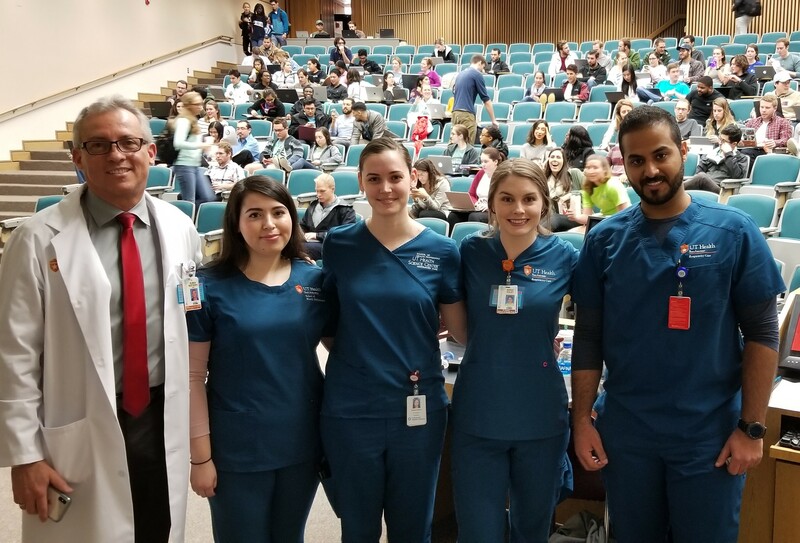 Respiratory care students presented information to medical students during the Respiratory Health Module on asthma, held Feb. 23. The event was one of a series of modules for medical students on various types of respiratory diseases. Medical students heard lectures and participated in a synthesis case study of a 12-year-old asthmatic patient. The program emphasized the importance of interprofessional collaboration, said Mandie Svatek, M.D., a pediatrician at University Hospital and assistant professor at UT Health San Antonio Long School of Medicine. 'I endorse interprofessional communication and care when caring for any sort of patient, but especially the asthmatics," she said. Ruben Restrepo, M.D., RT, FAARC, professor in the department of respiratory care, presented a lecture to the medical students. He shared his perspective on how respiratory therapists interact with asthmatic patients in different settings such as the clinic, emergency room, intensive care unit or floor of the hospital. Improving education on managing asthma can have a major impact an Americas' health, Restrepo said, adding that 25 million Americans have asthma, a leading cause of absence from work and school. Second-year Respiratory Care students Rachel Stone, Sarah Haley and two other students presented information on types of inhalers and the asthma action plan. "We gave a brief overview of what we do and what we should do with the doctors," Stone said. "Then we talked about the different types of inhalers and demonstrated how to use them I shared dry powder inhalers and their techniques and how they are used." Haley, who presented the three-level asthma action plan, viewed the program as a success. "I think it went well," she said. "We had some students asking us questions after the presentation. It made them more aware of how important it is to have a respiratory therapist on board as part of the team. I think it's important to know every role and responsibility as part of the health care team. Haley, who had asthma as a child, said she relates to the subject matter on a personal level. "I was on the patient care side of it," Haley said. "I think it helps me be more aware of the patient's needs and more compassionate.